The head of SNC-Lavalin says its role as a Canadian global champion will be undermined if the embattled engineering firm is barred from bidding on federal contracts and its local employees are forced to work for foreign competitors. SNC-Lavalin's local employees will be forced to work for foreign competitors if the embattled engineering firm is barred from bidding on federal contracts, diminishing its role as rare Canadian global champion, the company's CEO said Wednesday. "There would be a reduction with us but these are talented folks. They'll get a job," Neil Bruce said in an interview with The Canadian Press. Unlike the Trudeau government, he said the Montreal-based company has never cited the protection of 9,000 Canadian jobs as a reason it should be granted a remediation agreement to avoid a criminal trial. "This thing that somehow they're going to be unemployed is not true because they are highly qualified, highly experienced people." However, he says there's a public interest for such an agreement because its well-qualified employees will be forced to work for U.S. or European competitors if it is barred from bidding on federal contracts for a decade. Analysts have countered that argument, pointing out that more than half of those 9,000 workers are currently engaged in multi-billion dollar construction projects that are years from completion, and that it's unlikely SNC will be prevented from bidding on provincial contracts. An economic reality check on SNC-Lavalin: Are 9,000 jobs really at stake? SNC-Lavalin faces accusations it paid bribes to get government business in Libya — a criminal case that has triggered a political storm and cost Prime Minister Justin Trudeau two cabinet ministers and his most trusted adviser. Bruce said about 75 per cent of the company's rivals have concluded deferred prosecution agreements in their host countries and are free to work in Canada. Meanwhile, Bruce said he still doesn't know why the director of the Public Prosecution Service of Canada and former attorney general Jody Wilson-Raybould were not open to granting a remediation agreement. 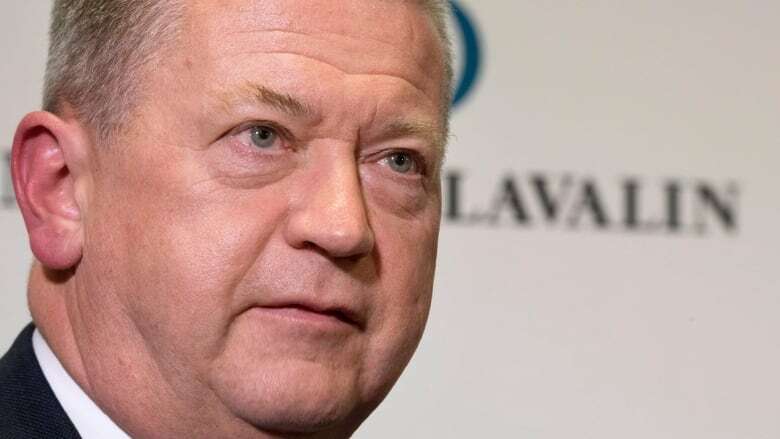 He said SNC-Lavalin employees feel bruised and battered by the last six weeks since a report surfaced that government officials pressured the former attorney general to grant the company a deferred prosecution agreement. "And I think fundamentally that's unfair on our employees who had nothing to do with what went on seven to 20 years ago." While he's not surprised that politicians would make hay out of this issue during an election year, Bruce said he's concerned that policymakers haven't been as willing as other countries to defend home-grown companies and their workers. He said there's no plans to move the company's headquarters from Montreal, adding competitors are envious of its shareholder base that is 82 per cent Canadian and led by the Caisse de depot which has helped fund its acquisition of British engineering firm Atkins. "We see ourselves as Team Canada. We are a global champion, one of few. There's not many and we're proud to be Canadian."